Baker's assistant Gauhjaroy Kiyikiboyeva displays a tray of Tashkent-style non, stamped, oiled and ready for the tandoor oven. Respect for non is respect for country. The sun was coming up as I followed the scent of wood smoke and freshly baked bread that drifted down a chilly dirt lane in an aging neighborhood on the outskirts of Tashkent, the capital of Uzbekistan. Working my way against rush-hour traffic of bicycle-mounted bread-delivery men and bundled-up children carrying home stacks of steaming bread in plastic bags, I turned into an unmarked open gateway in a mud-plastered wall. In the courtyard I found fifth-generation baker Raushanbek Ismailov with his entire upper body inside the opening of his 315-degree centigrade tandoor oven. He soon reappeared, and then deftly continued to place rounds of dough onto a handheld cushion, leaned back into the oven and slapped each round onto the white-hot walls. Minutes later, he was pulling out dozens of fragrant, golden, crusty loaves called non (pr. nahn), which he arranged on an old metal bedframe to cool. 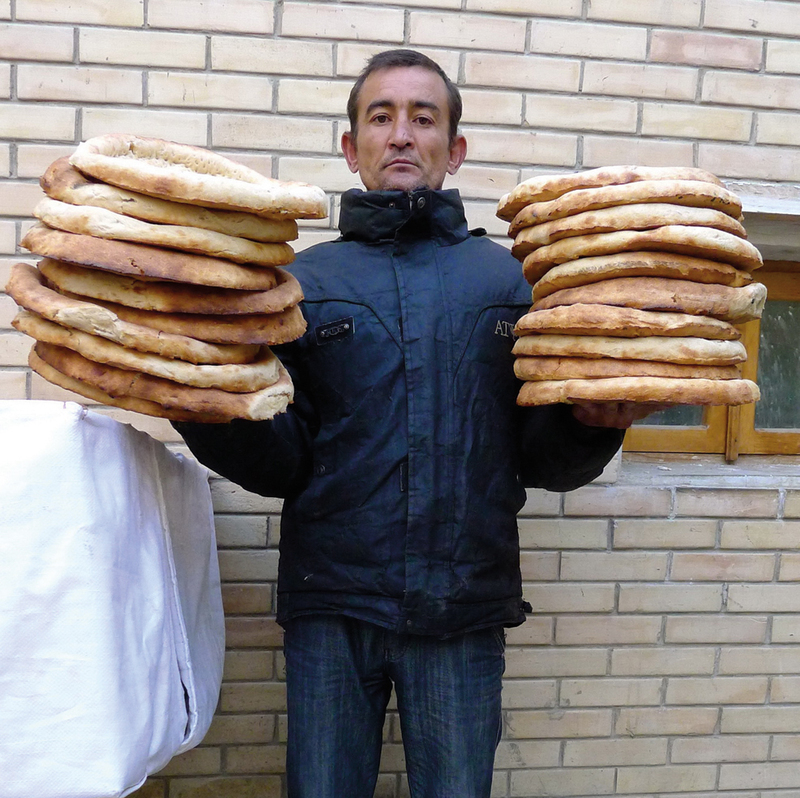 Raushanbek Ismailov is a nonvoy—a bread baker; here, he braids a decorative, Tashkent-style non. 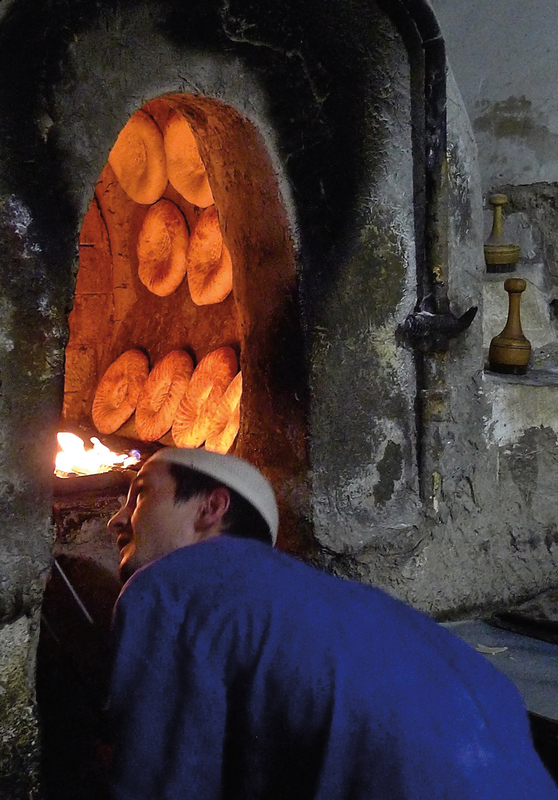 In Bukhara, Erkin nonvoy keeps an eye on loaves baking along the walls of his tandoor oven. The word “non” comes from Persian, where it is sometimes transliterated “na’an” or just “naan.” Throughout the region, the word refers to a variety of wheat-flour, leavened flatbreads with the slightly smoky sourdough tastes and textures that are the result of being cooked in large clay (tandoor) ovens. Locally, Raushanbek is a nonvoy—a bread baker. He specializes in the Tashkent style of non, which is just one of the classic examples of the varied, tandoor-baked breads of Uzbekistan. Pausing for a moment to greet me, Raushanbek smiled, handed me a hot loaf and went back to his baking. I took a bite. It was warm, crisp, chewy perfection, with an open, airy crumb and just the right amount of char and flavor. The texture, subtle taste of roasted grain and slightly smoky aroma immediately reminded me of my first Central Asian tandoor-baked bread in Herat, Afghanistan, in 1973. Now, after 42 years, I was in neighboring Uzbekistan, visiting bread bazaars, interviewing bakers, sampling bread and talking to everyday customers about the significance of bread in Uzbek culinary and cultural traditions. I wanted to discover why Uzbek non is widely considered to be the very best of Central Asian tandoor breads. At the Ulugbek non bazaar in Samarkand, bread vendors pile their tables with non and festive patyr bread. For the next two hours, Raushanbek nonvoy and his assistant Gauhjaroy Kiyikiboyeva demonstrated their bread-baking process. It started with an old cast-iron bathtub full of bubbling xamir (pr. khamer)—a sourdough prepared the night before. 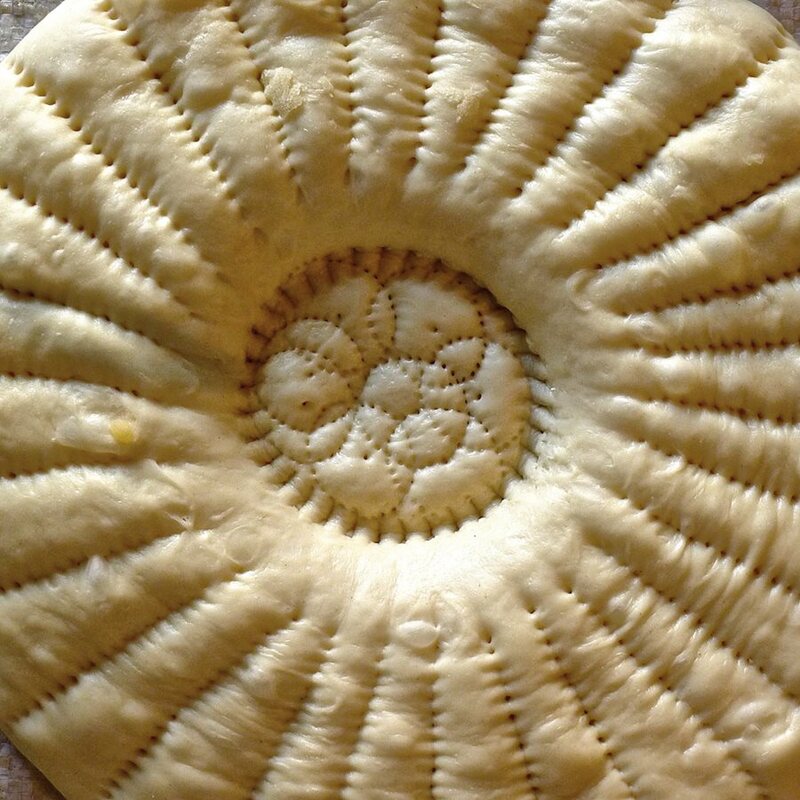 They weighed out handfuls of dough, rolled it flat, applied the traditional perforated designs with metal bread stamps called chekich, and then followed this with a pattern of spoke-like indentations. Then they brushed the flattened dough with oil that would give it a golden color, sprinkled it with sesame seeds and finally coated it with powdered milk mixed with water for taste. On an average day, Raushanbek says, he bakes some 50 large loaves and about 425 smaller loaves. Compared with non baked in other parts of Uzbekistan, Tashkent-style non is lighter, softer, more chewy and less dense. It is at its peak of perfection for only a few hours. Uzbeks prefer non hot from the baker, and this is why all bakeries employ a fleet of bicycle delivery men and boys who service the cafés, street stalls, markets, private homes and restaurants starting around five o’clock each morning. 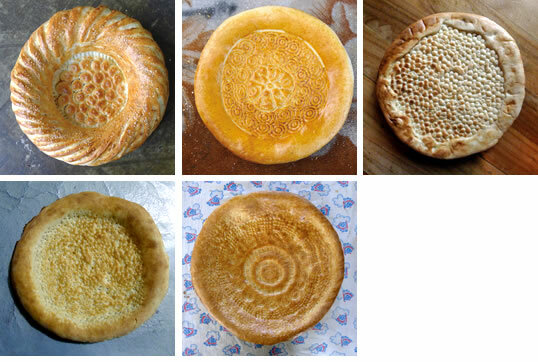 Left-to right from top: Bukhara-style; Tashkent-style with nigella and sesame seeds; festive Tashkent-style; Urgench-style from Khorezm Province (2); Tashkent-style. 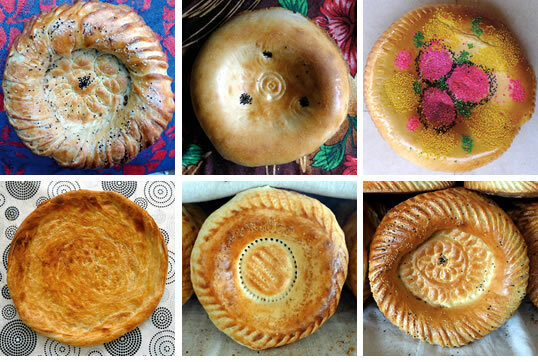 Left-to right from top: Tashkent-style; Samarkand-style with nigella seeds; Samarkand engagement bread, Siab bazaar; Bukhara-style, Kritiy bazaar; Tashkent-style, Chorsu bazaar (2). 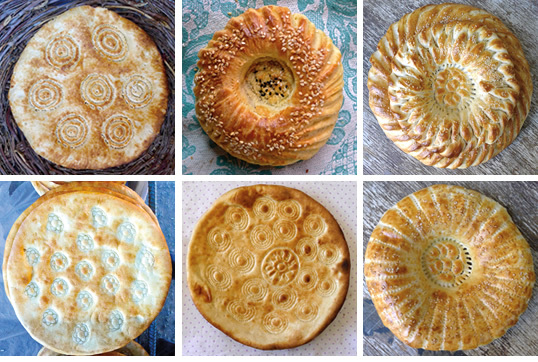 Left-to right from top: Two Samarkand patyrs, flaky with shreds of onion; Bukhara-style, Kritiy bazaar; colorful Samarkand engagement bread with nigella and sesame seeds; Samarkand patyr; Tashkent-style, Ulugbek bazaar. Left-to right from top: Tashkent-style, by Raushanbek Ismailov; Samarkand, Siab bazaar; Khiva-style, Khorezm Province; Bukhara-style by Erkin nonvoy; Bukhara-style, Kritiy bazaar. Wheat and barley were first domesticated in the Fertile Crescent around 10,000 years ago, but not until leavened bread was discovered in pharaonic Egypt, most likely by accident, did bread as we know it today become an essential part of the daily diet for much of the world. Several theories surround the discovery of leavened bread. Ground or milled cereals mixed with water and left out in warm conditions attract airborne yeast spores that occur everywhere. A second possibility is that Saccharomyces cerevisiae, a strain of wild yeast found in the Nile River, could have been added to wheat or barley flour and thus started the process of fermentation. This is not unlike Pliny the Elder’s first-century ce note that foam taken from beer can be added to water and flour to produce “a lighter kind of bread.” However the process started, Uzbek-style non is old enough to have been mentioned in the Epic of Gilgamesh (tales of the ruler of the Sumerian Kingdom of Uruk) that dates from 2700 bce, and cuneiform writings from that time include Sumerian poems and myths about the invention of bread, along with recipes. Like coffee, tea or dates, sharing bread has been elemental to the region's hospitality traditions for millennia. Non is found in many shapes and sizes, and with different flavors, throughout Iran, Turkic Central Asia, Afghanistan, Pakistan, northern India and China’s western Xinjang Province. 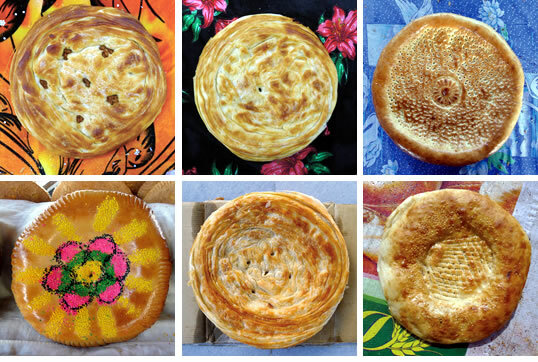 Uzbek non is easily recognized by its round shape, shallow depression in the middle, soft chewy texture, distinct flavors, golden crust, and frequently intricate decorative patterns. 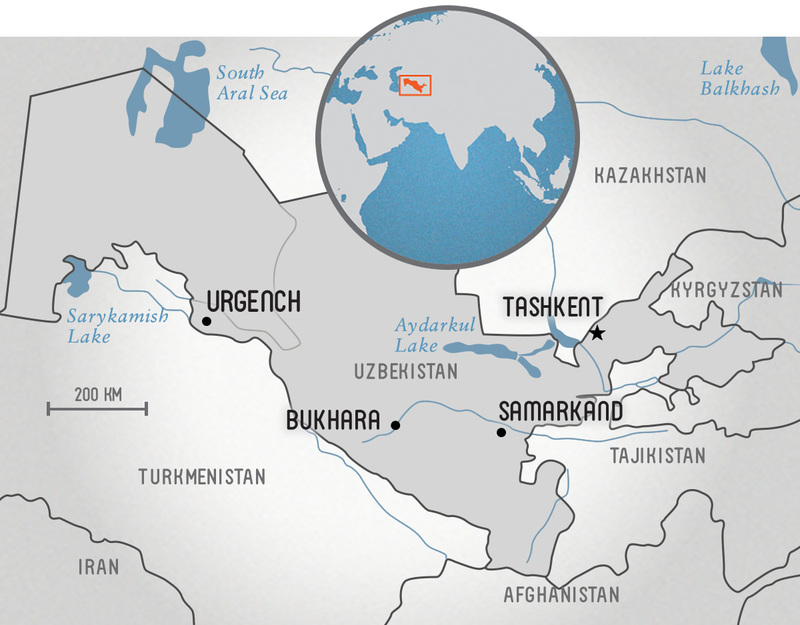 Uzbek non, as I discovered, varies in taste, size and appearance from province to province, city to city, town to town. Like coffee, tea or dates, sharing bread has been elemental to the region’s hospitality traditions for millennia. (Similarly, in Christian traditions as well as in other cultures, “breaking bread” is an ancient gesture of friendship, respect and hospitality.) Here, it goes further still: Uzbek non is put beneath the head of a newborn child, in hopes that it will give the baby a long life. Non is also placed between the legs of a toddler just learning to walk, to wish the child a blessed journey through life. Non in Uzbekistan is rarely, if ever, cut with a knife at home or in traditional social settings: Rather, it is broken into pieces by hand. It is considered disrespectful to place a loaf of bread facedown, and even more so to allow crumbs to fall on the ground. Uzbek tradition appears to take the God-given sacredness of bread seriously: For example, when a piece of bread does fall to the ground, tradition calls for it to be picked up and placed on top of a wall or in the crook of a tree for the birds while saying “‘aysh Allah” (“God’s bread”). The Spanish use a similar phrase in the same situation: Es pan de Dios, and the saying dates from the time of the Muslim presence in the Iberian Peninsula. 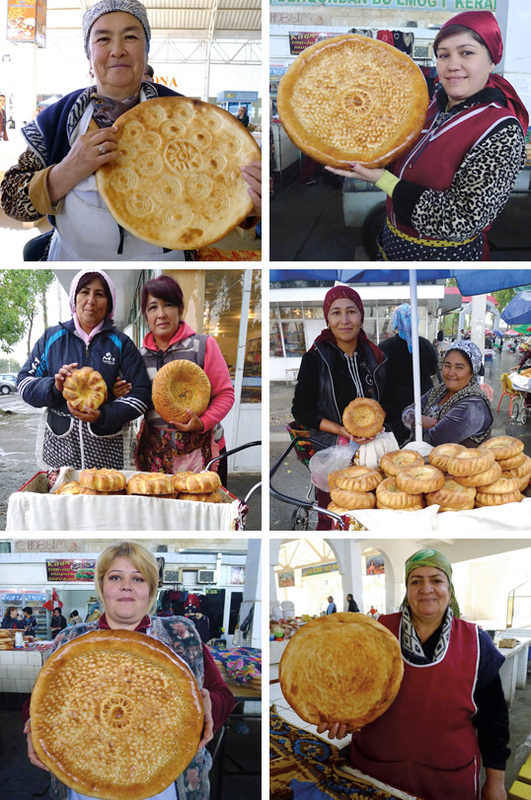 Top row: Bread saleswoman Salomat displays non stamped with the storybook names Tahir and Zuhra at her stall in Urgench. Bukhara-style non in the Kritiy bazaar of Bukhara. Middle row: Two photos of vendors each show Tashkent-style non in the Chigatay Darvoza bazaar. Above: Two photos show Bukhara-style non in the Kritiy bazaar. 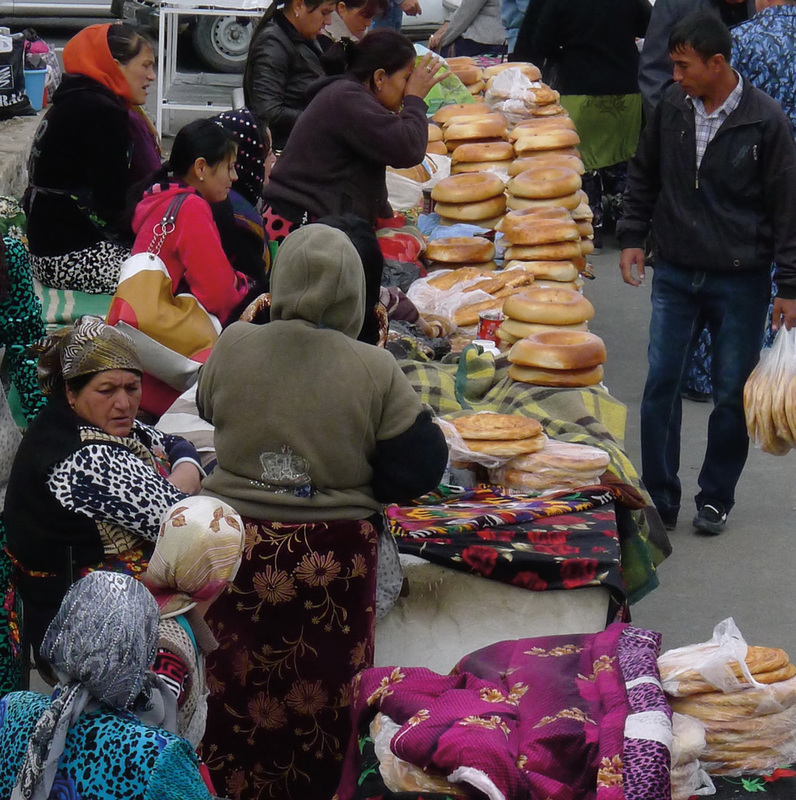 One rainy day in Tashkent, I walked to Chigatay Darvoza non bazaar, the local outdoor bread market. Women were standing under huge umbrellas with their loaves of bread safely tucked up and protected in colorful blankets placed in old baby buggies. No sooner did the rain stop than they set out the loaves for display. Despite the wet, blustery weather, everyone was keen to be photographed, proudly holding one of her finest loaves. Across the street from Chorsu bazaar, the huge central market of Tashkent, I visited a row of shops specializing in bakery supplies. There I met Bakhrom, a seventh-generation chekich ustasi or bread stamp master. Decorative chekich patterns mark the center of each loaf, and they not only give the non from each bakery a distinctive look, but they also compress the center of the bread so that only the unstamped outer rim will rise. 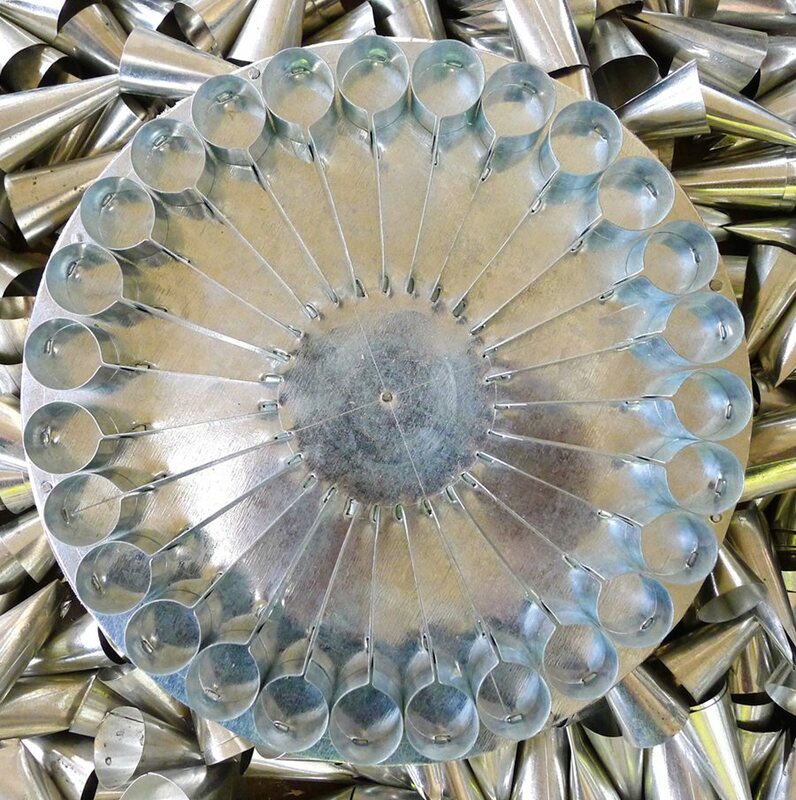 In addition, radial, spoke-like patterns on the perimeter of Tashkent-style non comes from a tool called bosma (“press”), which is commonly made out of repurposed spokes from a bicycle wheel. Timor, a deliveryman in Bukhara, holds non that he will carry to customers by bicycle. Travelling southeast from Tashkent by road, I arrived in Samarkand, where my friend Zafar Jahongirov walked me to the non section of the Siab bazaar. He explained the importance of non in engagement parties and wedding ceremonies. Engagement bread is easily identified in the public markets by its bright pink and yellow colors. This bread is always bought in pairs because even numbers are considered good luck. At the engagement party, the two families break the bread, share it out and eat it to formalize the engagement and to celebrate the two families coming together. Later, on the day of their wedding, the bride and groom take bites from two plain round loaves of non placed face to face. The loaves with the two bites missing are then set aside until the next morning, when they finish the non at their first breakfast together as husband and wife. Jahongirov also told me that similarly, before an Uzbek son leaves home for military service or to work or study abroad, he will take a bite from the edge of two loaves of non placed face to face; the family then dries the bread in the sun and hangs it near the ceiling until the son returns. 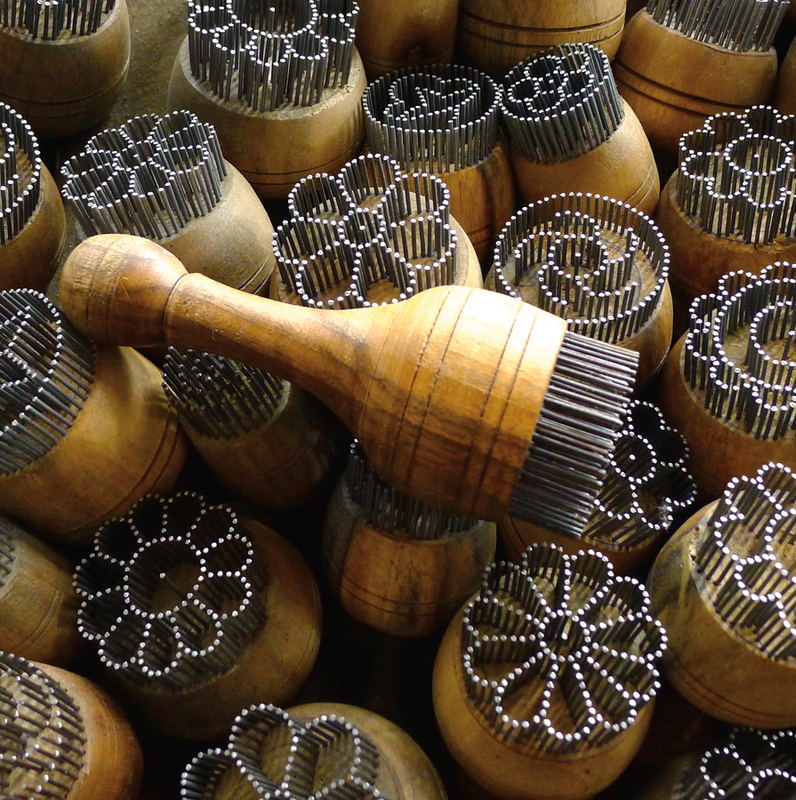 At the Chorsu bazaaar in Tashkent, the tools used to decorate non are works of art in themselves. Chekich (bread stamps), top, often are made of nails arranged in patterns. They prevent the center of a loaf from rising too high, and the holes they create allow steam to escape. Bakers often use the patterns as signatures. A large bosma (“press”) bread stamp, above, uses a Tashkent-style pattern. 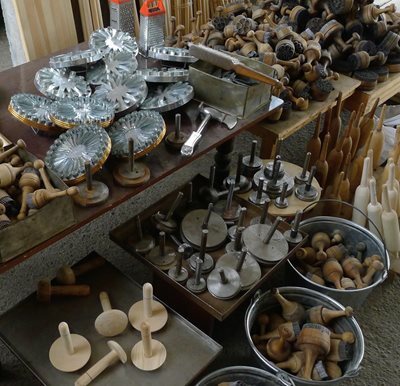 Below: More assorted instruments for bakers. Near the Siab non bazaar, Izzat nonvoy was in the middle of baking when I dropped in to see him at work. He specializes in the Samarkand style of non, which has a darker crust, and it is heavier, larger and more filling than the Tashkent varieties. The texture is dense, and the finished loaf is coated with a light sheen of oil. Samarkand non freezes well, and it is frequently taken overseas as a gift from home. Once thawed, sprayed with a little water and microwaved, the loaf, Jahongirov said, tastes as if it was freshly baked. At the famous Ulugbek non bazaar, near Samarkand’s historic 15th-century observatory, the vendors specialize in patyr, a festive bread made by folding multiple layers of dough with rendered mutton fat or butter and shreds of onion and herbs. The patyr dough is rolled into a cylinder, cut to size and then rolled out again before baking. This process creates a wide, flat, slightly flaky bread similar to puff pastry or a very large Indian paratha. As a testament to the excellence of the Ulugbek patyr, the passengers of long-distance taxis were already lined up at 6:00 a.m. buying dozens of loaves to share with friends and family hundreds of kilometers away. This statement proved true: In the back-street bakery of Raim nonvoy, his assistants kept offering me hot Bukhara non with a multitude of toppings, including fried eggs, cheese, yoghurt, honey and jams until I could hardly walk. 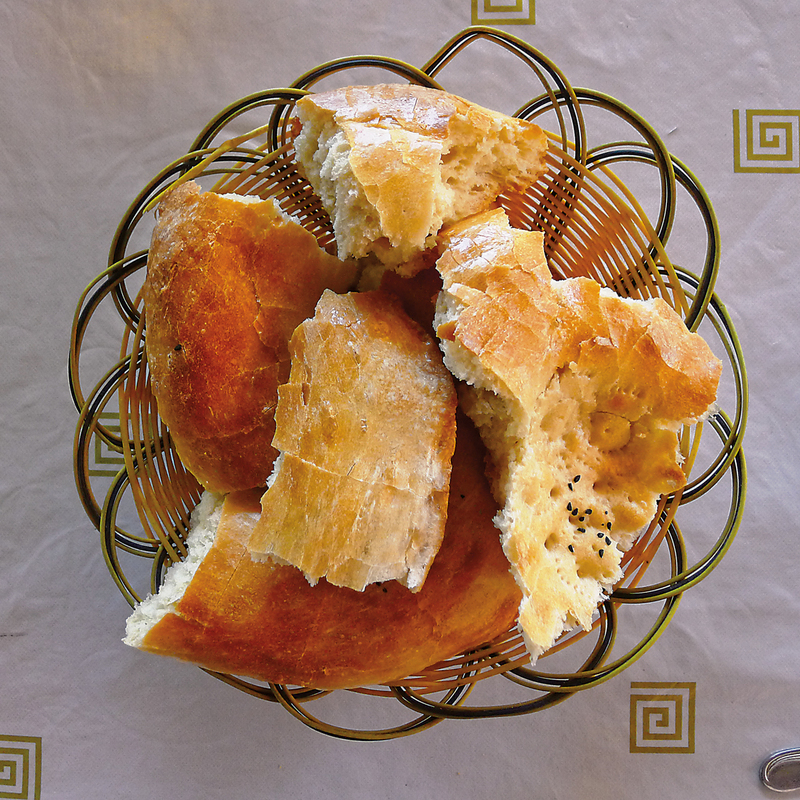 When I asked Raim why his bread was so much more expensive than at other bakeries, he said, “Because my bread tastes so much better than the others!” Bukhara non falls somewhere in density between the Tashkent and Samarkand styles, and it is sprinkled with blackened nigella seeds. 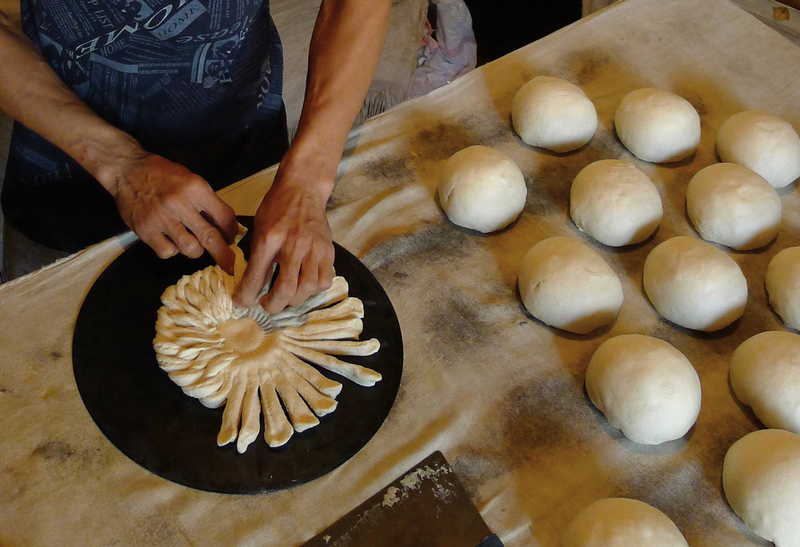 Tashkent-style non dough is stamped with chekich and bosma patterns, and it is ready for the oven. While setting up a loaf of non to photograph, I started to brush aside some crumbs. An assistant leapt forward to catch them before they hit the floor. “Please, do not do that. Bread is sacred,” he reminded me. That afternoon, I fell into conversation with Amir, the hotel receptionist. He told me a story about bread and Bukhara weddings: Uzbek weddings are often huge, and the average meal requires 300 to 400 loaves of non. Following the wedding reception, the oldest and wisest woman, the one with the longest marriage and the most life experiences, holds two rounds of non on the head of the bride. She walks her around the reception room while the bride says goodbye to her old life with her family. All the women and her parents kiss her and say goodbye. The old woman holds the bread, reads to her from the Qur’an, talks to her, wipes away her tears, reassures her that everything will be all right, and then she leads her to the room where her husband is waiting for their first night. 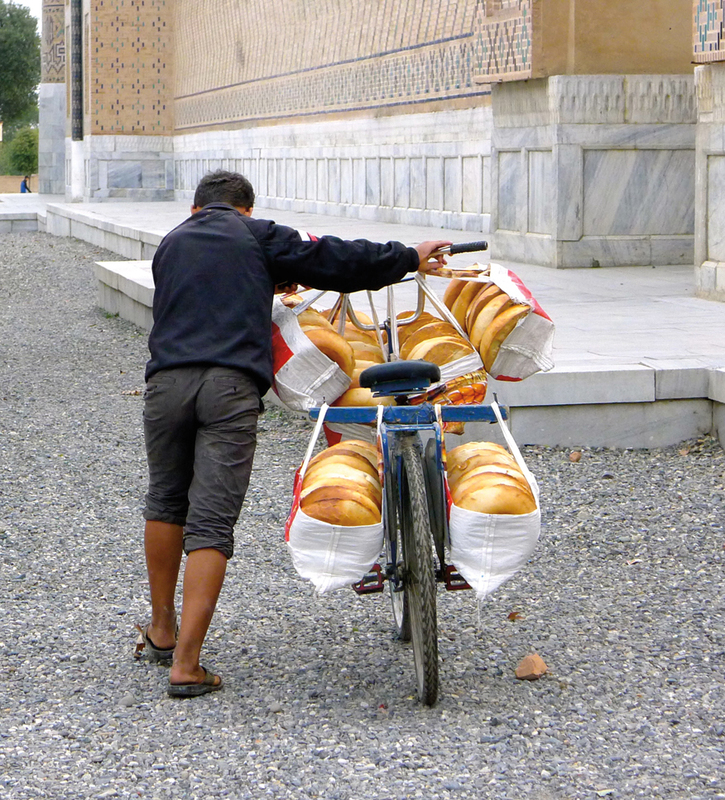 A delivery boy sets off in Samarkand using a bicycle fitted with a customized rack and bags. Throughout Uzbekistan, non is never cut with a knife: It is torn by hand, lending a special meaning to the ancient tradition of “breaking bread” with family, neighbors or strangers. The following day, I drove northwest across the Kyzylkum Desert, arriving in Urgench, the capital of Khorezm Province. The non of Khorezm is flatter, more cracker-like in texture, with chekich stamp marks covering most of the non, leaving a thin edge like pizza dough. Here, names from Uzbek folklore and literature are commonly used for decoration and to identify the different bakers. At the stall run by Salomat, a smiling, effusive woman of middle age, she explained the meaning of the names Tahir and Zuhra on her bread. They are, she said, a kind of Uzbek Romeo and Juliet, protagonists of an epic tale of star-crossed lovers, well known to the everyday bread buyers of Urgench. It is about fate, destiny, hope, sacred love, tragedy and God’s will. Not, I thought, the sort of life lessons or literary reference that might ever be found on the plastic packaging of pre-sliced Western breads. Back in Tashkent at the end of my journey, I was sipping green tea at a café when I noticed a car moving slowly down the street. A small child was standing up on a rear seat holding a small crust of non. The window was partially open, and as the car passed, the child accidently dropped the crust onto the road. From a nearby group of women, one immediately walked over, picked up the non, blew on it, kissed it lightly, uttered some words and placed the non on a tree branch, for the birds.